Auto Count Sdn. Bhd. introduces a special license for accountants to use AutoCount Accounting to do their accounting work. This license control, known as the Accountant License, is available in the 1.8.7.61 version of AutoCount Accounting onwards. To use this license control, each prospective Accountant License user will have to write in and register with Auto Count Sdn. Bhd. They will then be supplied with the password that they will use to login into AutoCount Accounting via a special login screen which will be discussed later. To set-up the AutoCount Accounting to allow for Accountant License user, the administrator of the account book will have to first maintain a list of Accountant License user in the Accountant Maintenance. In this function, accessible via the Tools -> Option -> Miscellaneous -> Accountant Setting, the administrator could maintain the Accountant License user as well as set the access time for each user. 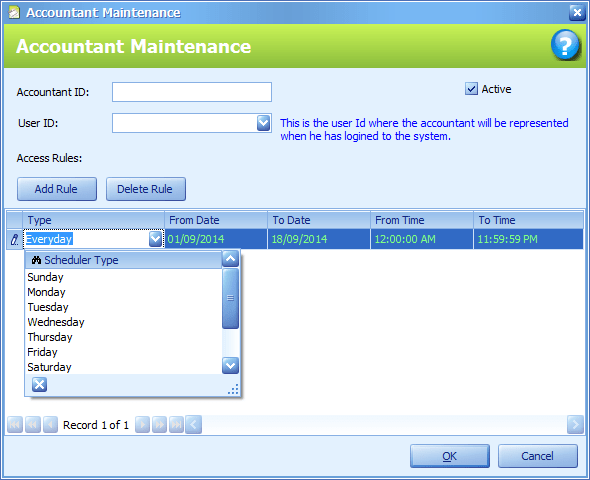 This access time function will limit the access of the Accountant License user to the specified day and time set by the administrator. The administrator could also set under which Accounting user, the Accountant License user could sign-in as. This will in effect, apply the Access Right of that user on the Accountant License user. 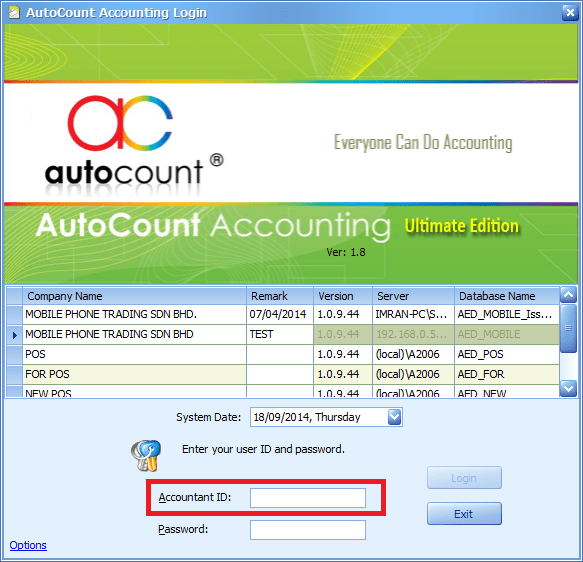 To sign-in into AutoCount Accounting with the Accountant License login, the user will have to access the login function by pressing the combination Ctrl + Alt + A in the AutoCount Login screen. This combination of buttons will change the current login screen into the Accountant Login where the user can enter their Accountant ID and password to sign-in. The Accountant License sign-in is special in that the user can stay signed-in for 7 days. However this functionality requires that during the first user sign-in, the PC used to sign-in must be connected to the Internet for authentication purposes. Subsequent sign-ins in a period of 7 days will not require the Internet connection. This also will mean that, since the user is signed-in into a PC for 7 days, that sign-in detail cannot be used with another PC until the user has sign-out from the previous PC. Be advised that after the 7th day, if the user did not sign-out of the account, he will also be unable to sign-in into the account unless he sign-out first. If an Accountant signs in into an unregistered account book, the authentication process will only be done against the Auto Count Server. However if the Accountant signs in into a registered account book, the authentication process will be done against the Auto Count Server as well as against the Accountant Maintenance table. Hence if the account book is registered, the previously mentioned setup process must be done before the user can use the Accountant ID sign-in. For unregistered account book user, there is a limitation of use in which they will only be able to access the Accounting module and no other modules available in it when signing in using the Accountant sign-in. The registered account book user will not be limited by this limitation and will be able to access the modules purchased for AutoCount Accounting as well as the access rights that have been applied to them in the Accountant Maintenance. In its core, there is no difference between a user doing a normal login when compared to an Accountant user logging in. 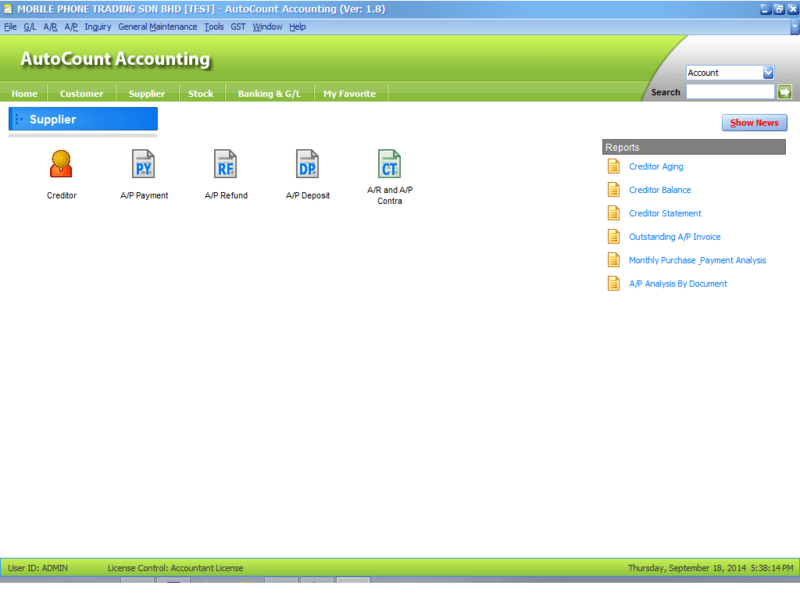 Both of them are able to access the same features and functionality available to them in AutoCount Accounting. The exception to this is the ability to change the “ADMIN” user password, which is not available to the Accountant user. When an Accountant user shuts down the AutoCount Accounting software, a prompt will be given to the user, asking if the user wishes to sign-out. If the user wishes not to sign-out, please remember that the time limit of being signed-in is 7 days and they must sign-out if they wish to sign-in after the 7th day.